Fresh lemon and sage, Granny Smith apple, onion and butter impart their unique flavors as this bird roasts. The sherried cider gravy perfectly compliments this whole roasted turkey. For Turkey: Rinse turkey and pat dry inside and out. Season turkey inside and out with salt and pepper. Place 1 lemon wedge, 1 sage leaf and 1 bread slice into neck cavity. Fold neck skin under body and fasten with a skewer. Fill body cavity with quartered apple and onion, 3 sage leaves and remaining lemon wedge and bread slice. Truss turkey. Rub turkey with remaining sage. Spread turkey with butter and arrange on rack in roasting pan. Roast turkey in middle of preheated 425°F (220°C) oven 30 minutes. 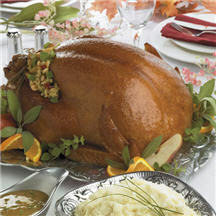 Reduce temperature to 325°F (160°C) and baste turkey with pan juices. Add water to roasting pan and roast turkey, basting every 20 minutes. Continue to roast 2 1/2 to 3 hours more, or until the internal temperature reaches 180°F (85°C) in the thigh and the buttonhead of the timer "pops” up. Transfer turkey to a heated platter, reserving juices in roasting pan; discard string. Keep turkey warm, covered loosely with foil. For Sherried Cider Gravy: Skim fat from pan juices, reserving 1/4 cup fat. On range top, deglaze pan with sherry over moderately high heat, scraping up brown bits. Stir in cider. Bring sherry mixture to a boil and remove pan from heat. In a heavy saucepan, whisk together reserved fat and flour and cook roux over moderately low heat. Whisk together for about 3 minutes. Add sherry mixture and 2 cups stock in a stream, whisking to prevent lumping. Simmer, whisking occasionally for about 10 minutes. Whisk in additional stock to thin gravy if desired. Season gravy with salt and pepper and transfer to a heated gravy boat. Garnish turkey with sage, if desired. Recipe provided courtesy of the National Turkey Federation and Volk Enterprises, Inc.